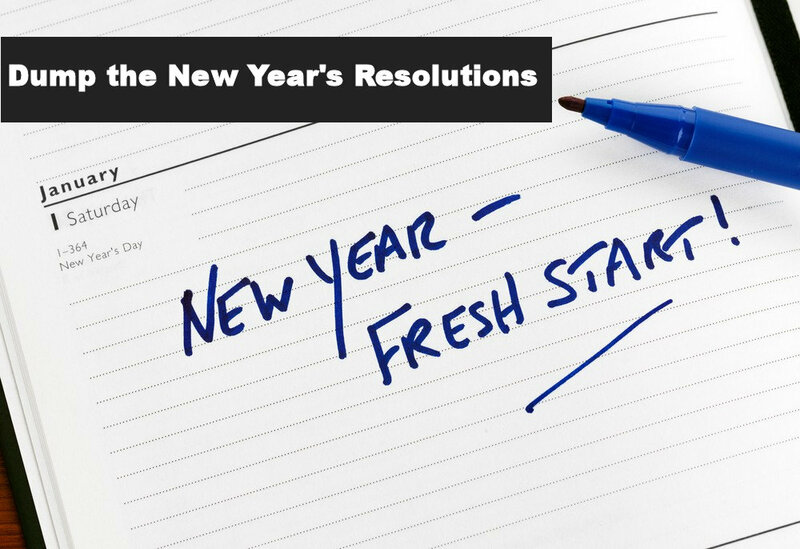 It's time to DUMP New Year’s Resolutions! As the current year is nearing its end, many people are thinking about making New Year’s resolutions. Not me… or at least not anymore. I’ve blogged about New Year’s resolutions numerous times over the years, but like 80+% of New Year’s resolutions ever made, the majority of my personal resolutions have usually gone by the wayside (read ‘failed’) by February. Not knowing how to achieve the goal. In my opinion, the last reason on the list above seems to be the most prevalent for failure to accomplish a goal. For example, if, having never drawn a stick figure, I decided that this was the year I was going to fulfill my long-held desire to ‘paint a landscape’, there are many things I’ll have to learn before I apply paint to paper… or would that be canvas? So, now, instead of making resolutions, I choose what I want to learn about in any given year, i.e. ‘learn how to paint a landscape’. Learning how to do something feels much more inviting than compelling oneself simply ‘To Do’. In order to begin the learning process, I’ve found that instead of Googling ‘learn about _____’ or ‘learn how to ______’, then spending time to search through a haphazard array of results; going straight to a source for educational courses usually delivers what I need and want in a timely – therefore, more cost-effective – manner. One of those ‘sources for courses’ is Udemy, an online learning platform aimed at professional adults, taught mainly by professionals in their field. Udemy made a special effort to attract corporate trainers seeking to create coursework for employees of their company. Of course, you don’t need to drill down through all the categories and sub-categories to find a course on Udemy. 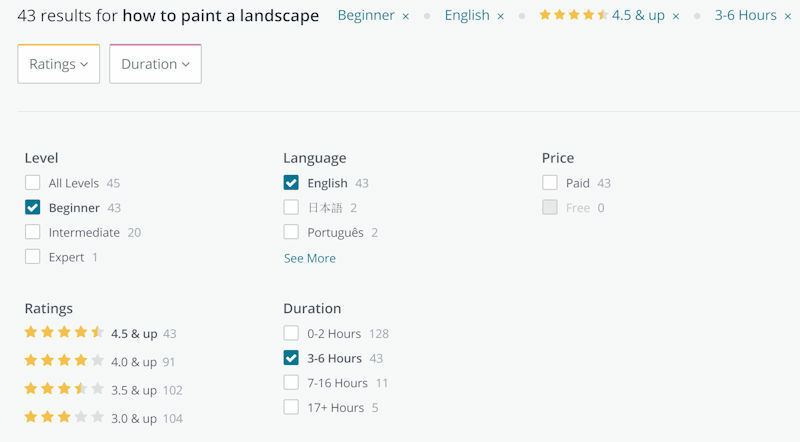 I searched for ‘how to paint a landscape’ and although there were 1465 results to that search, once I selected my preferred filters, (Beginner, English, 4.5+ rating, 3-6 hours in length) I ended up with only 43 courses from which to choose. 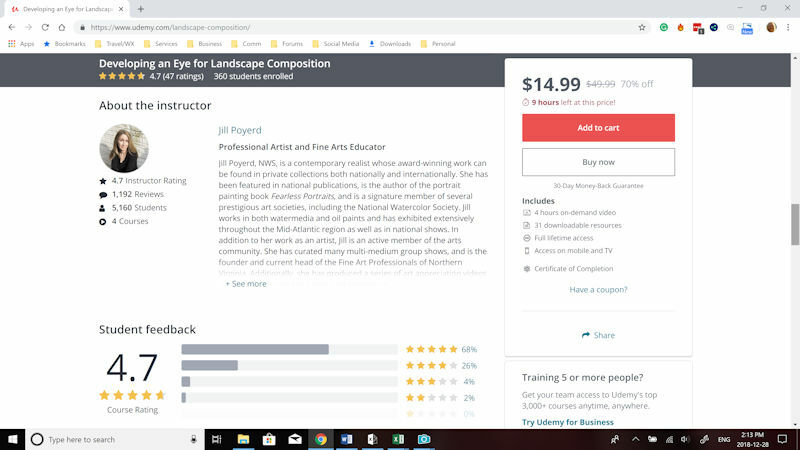 The ‘Developing an Eye for Landscape Composition’ course spoke to me as it has had 5,160 students with an instructor rating of 4.7, and 1,192 reviews. The fact that almost a quarter of the students bothered to write a review and then rated the instructor that highly tells me that it’s a great course. Because we’re on the road with very limited Internet bandwidth until we get home in March when I can stream video again, having full lifetime access is a real bonus! In the meantime, I’ll be taking photographs of landscapes that I might want to paint! Anyway, I hope you too will dump the New Year’s Resolutions in favor of kindly and gently inviting yourself to learn something new. Something that you can look forward to doing, get excited about and most of all, ENJOY doing! Do you have comments or questions? Please share by leaving a comment! Happy New Years Ros. I bought 3 courses – 2 on photography and one on beginning watercolour painting. They were just $12.95 CA per course. We’ll have to see how this goes. Good for you! And so worth it with those discounts, eh? Have fun with your photography and painting! Happy New Year to you too, Barry!